Discover, visualize, use, and share maps from your iOS device. Interact with your organization's maps and data no matter where you are. Tell stories and brief stakeholders with interactive map presentations. 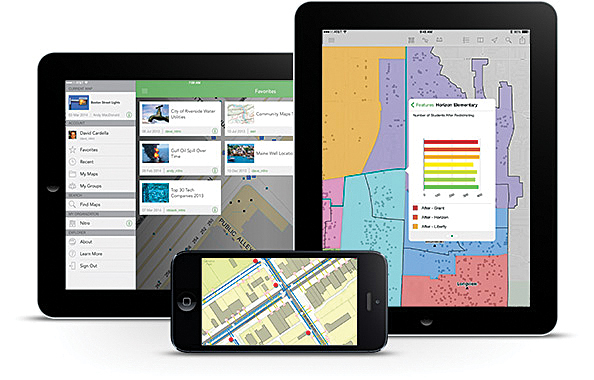 Explorer for ArcGIS is Esri's latest application in a family of ready-to-use apps to access and share maps on smartphones and tablets. The app is designed for anyone who needs to explore data in a geographic context and use maps to help make better decisions. It has a modern, easy-to-use interface, so whether users are experienced GIS professionals or have no prior GIS knowledge, they can become immediately productive. The Explorer app is available on iOS, with support for additional platforms coming soon. Users can access any of their organization's maps and hosted or on-premises data authored in ArcGIS Online or Portal for ArcGIS. For example, users can search for places in their map and also search within specific layers to get information about particular assets, determine where assets are in relation to their current location, and quickly share that information with others. Maps can be shared several ways, including by e-mail; text message; and platform-specific methods, such as AirDrop (for iOS). The Explorer app also includes sketching tools that enable users to "redline" their maps and highlight important aspects of their data. Map sketching provides easy identification and verification of edits and lets Explorer users communicate and collaborate with each other easily. Users can brief decision makers and other stakeholders by using map slides, each containing a title, a set of visible layers, and an extent. Users can interact with a live map during their presentation and also view pop-up windows and sketch with no disruption. The Explorer for ArcGIS app will grow in functionality and become more powerful with every release. Over time, users will be able to take advantage of new capabilities, including authoring maps, publishing and editing data, and viewing in 2D or 3D. The app will improve the way people plan and execute the work they do every day and use maps as a medium for presenting, sharing, and communicating with others inside their organization. To download Explorer for ArcGIS, visit the Apple App Store. Anyone with an iOS device can download and try the sample maps included in the app. Support for Android and other platforms will be available in a later release. ArcGIS Online subscribers, trial users, and those with a Portal for ArcGIS account can simply download the app, sign in, and begin exploring their maps and data. For more information, visit esri.com/arcgisonline.